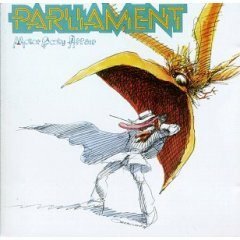 Motor Booty Affair is an album by funk band Parliament. Released in late 1978, it contains two of the group's most popular tracks, "Rumpofsteelskin" and "Aqua Boogie (A Psychoalphadiscobetabioaquadoloop)" which went to number one on the Billboard Black Singles chart. The album title refers to the music coming out of "Motor town" Detroit in the 70's. "Motown Records" was producing hit after hit and funk bands (e.g. Parliament) were blooming. Artist Overton Loyd prepared the cover of Motor Booty Affair. The main release consisted of a gate-fold album cover featuring a pop-up rendition of the city of Atlantis, with Loyd's artwork on the front and back covers. His illustrations included cartoon portraits of some of the "characters" mentioned in the songs on the album, including "Mr. Wiggles". It also included cardboard cutout figures featuring Loyd's cartoon illustrations of most of the characters mentioned in the songs. There was also a picture disk, with Loyd's illustration printed directly on the vinyl LP. The album was Parliament's fifth consecutive gold album (500,000 copies sold).